While lupus is not well known or understood, it is far more common than better known diseases such as leukemia, muscular dystrophy, cystic fibrosis and multiple sclerosis. Without early diagnosis and treatment, lupus can be severely debilitating, even deadly. See our blog for essential information on symptoms, treatment, and tips on living with lupus and other overlap conditions. 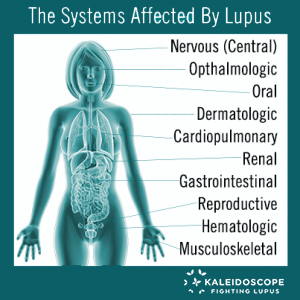 Lupus is a widespread and chronic autoimmune disease that, for unknown reasons, causes the immune system to attack the body’s own connective tissues and organs, including joints (rheumatoid arthritis), kidneys (lupus nephritis), heart, lungs, brain, blood, and skin (cutaneous lupus). Up to 1.5 million Americans are afflicted by some form of lupus, while more than five million people are known to be affected worldwide. Symptoms include fever, fatigue, loss of appetite, rashes, hair loss (alopecia), swollen glands, sensitivity to light (photosensitivity), chest, muscle and joint pain, ulcers in the mouth or nose, and others. Typical treatments include steroids (like Prednisone), painkillers, and immunosuppressants, as well as behavior and diet changes. In March 2011, Benlysta became the first FDA-approved lupus drug treatment in over 50 years. Ninety percent of those afflicted are women and 80% are between the ages of 15 and 45. People of color are two to three times more likely to develop lupus than Caucasians. If left untreated, lupus is potentially fatal. Lupus can lead to organ damage and failure. Serious conditions that can arise include kidney disease, pancreatitis, pleurisy, vasculitis, pericarditis, and cancer. Lupus is one of America’s least recognized major diseases. While lupus is widespread, awareness and accurate knowledge about it lags decades behind many other illnesses. Living a full life with lupus is possible, but doing so relies heavily on early diagnosis and consistent treatment. More than 16,000 Americans are diagnosed with lupus each year. There are many treatments for lupus’ symptoms, but there is no cure…yet! Lupus is a widespread and chronic (meaning long-term or lifelong) autoimmune disease that, for unknown reasons, causes the immune system to attack the body’s own tissue and organs, including the joints, kidneys, heart, lungs, brain, blood, or skin. Lupus is one of America’s least recognized major diseases, despite the fact that upwards of 1.5 million Americans and over five million worldwide suffer with this debilitating disease. Ninety percent of those affected with lupus are women between the ages of 15 and 45, and of those, two-thirds are people of color. It is far more common than well-known diseases such as leukemia, multiple sclerosis, muscular dystrophy and cystic fibrosis combined. Lupus causes a wide variety of devastating symptoms. It can affect nearly every organ in the body with no predictability, causing widespread infections and inflammation. As of yet, lupus has no cure but advances in the medical and research community are continually being made, which will lead to earlier diagnosis, better treatments and eventually a cure. A healthy immune system protects the body against viruses, bacteria, and other foreign materials. With an autoimmune disease like lupus, the immune system loses its ability to tell the difference between foreign substances and its own cells and tissue. The immune system then makes antibodies directed against “self”. This debilitating disease affects each patient differently. Discoid lupus erythematosus: This type affects the skin and is also known as cutaneous lupus. Drug-induced lupus erythematosus: Drug-induced lupus can occur as a side effect of some drugs, such as beta blockers, which are commonly used to treat heart disease and hypertension. Neonatal lupus erythematosus: This is a rare form of lupus in newborn babies, whose mothers have lupus, and can cause problems at birth or in rare cases, a serious heart defect. Systemic lupus erythematosus: Systemic lupus causes inflammation in multiple organs and body systems. First of all, it is important to know that lupus is not contagious. Secondly, it is a fact that even medical professionals and researchers can not say for certain what causes lupus. Most of those in medical and research professions will agree that several factors might determine an individual’s likelihood to develop lupus. Genetics. While a family history of lupus does not mean an individual will get lupus, it can determine a person’s likelihood for the disease. Environment: Research is being conducted regarding environmental factors that may play a roll in being a trigger for lupus. Exposure to UV light (photo-sensitivity), smoking, stress, or toxins may or may not be contributing factors. Hormones and Illness: Because of the fact that women in their childbearing years are the most common demographic afflicted with lupus, research is suggesting that higher levels of hormones, such as estrogen and progesterone, are linked to auto-immune diseases like lupus. People affected with viruses and bacteria, such as parvovirus, hepatitis C, or Epstein-Barr (EBV) may develop lupus, but a direct causal link has not been established. Medications: Some medications are suspected triggers of lupus and symptom flares, thus a subset of the disease. Drug-induced lupus is based on this theory. Often, once a patient with drug-induced lupus stops taking the medications suspected of inducing the lupus, the symptoms can decline rapidly. A Combination of Factors: Many in the medical and research fields believe that a combination of all the above listed factors is likely more susceptible to getting lupus, than a person with, perhaps, only one of the factors. Lupus continues to remain a mystery to doctors, researchers and the general public. With continued research and education, one day we will understand better what causes this autoimmune disease to occur. To learn more about lupus, common diseases that overlap with lupus, coping with a chronic illness, advice for caregivers and much more, please visit our Blog.